U.S. 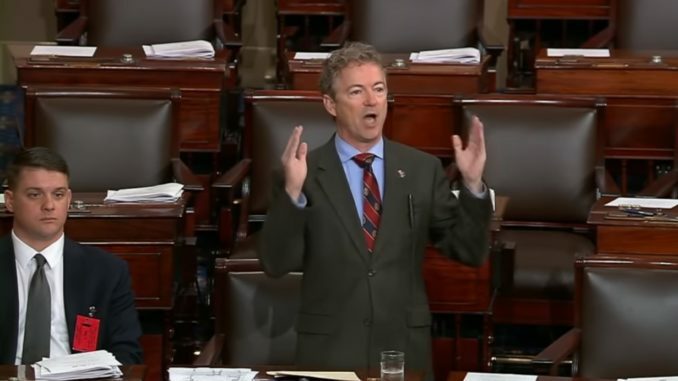 Senator Rand Paul recently condemned the Saudi-led war and growing humanitarian crisis in Yemen on the Senate floor, where he proposed a symbolic resolution that sought to block the sale of offensive weapons and support to Bahrain, a member of the Saudi war coalition. Senator Paul said that he would have preferred to push for a direct vote on whether the US should be at war with Yemen, but clarified that this was not possible because most other American lawmakers “will vote against this because they do not believe Congress…should tell the President when we go to war”. Mr. President, I rise today to call for an end to the U.S. involvement in the war in Yemen. There might be a good excuse for not knowing there is a war in Yemen because the media seems to be preoccupied with other things, but we have been involved with supporting the Saudi coalition, the Saudi alliance with nine other nations, including Bahrain, which has been bombing Yemen. You might not know much about Yemen, either. Yemen is one of the poorest countries on the planet. There are about 17 million people who live on the edge of starvation there. This year they suffered an epidemic of cholera. Over 1 million people had cholera, and thousands of people died. This is a country so impoverished that even when there is no war in Yemen, they live on the very edge of being able to survive. The pictures are heartrending. If you see the pictures of the small children with their swollen bellies–swollen because they don’t have enough protein so that the fluid literally drains from their blood system into their bellies. The pictures are heartrending, and your tax dollars are supporting this war. This war started under the previous President, and this war continues under the current President. Yet Congress doesn’t have the spine, doesn’t have the will to stand up and say: It is our job to declare war. It is our job to represent the people, to listen to the people, and decide whether we should be at war. The Constitution in article I, section 8 says “Congress shall declare war.” It is unequivocal. Yet here we are, involved in yet another war. We are involved in a war in Yemen. We have been involved in a war in Syria. We have also been involved in a war in Libya. We have also now been at war with people in Afghanistan, who had nothing to do with 9/11, 18 years later. These wars go on and on because Congress–and specifically the Senate–doesn’t do their job. We have heard people on television yelling “do your job, do your job” at their legislators. That is fine, but let’s debate what our job is. The Constitution is very clear that one of our jobs is to declare war, and we have abdicated that responsibility and have not lived up to it. I would like to have a direct vote on whether we should be involved in Yemen, a direct vote on whether we either declare war or we don’t, but that is forbidden because I am in the minority–not in the minority party but in the minority ideologically. The vast majority of this body doesn’t care about directing foreign policy; they say that the President has unitary authority, and the Commander in Chief can do whatever he or she wants. That is what the vast majority of these people believe. So they will vote against this because they do not believe Congress really should tell the President when we go to war. I would like to vote directly that we should not be at war in Yemen; we should not be involved with supplying, refuelling, supplying bombs to the Saudis, the Bahrainis and their coalition. I am forbidden from that vote, but because of a 1976 law called the Arms Export Control Act, I am able to object to arms sales. We have done this twice in the last year. We objected in a bipartisan way to the sale of arms to Saudi Arabia because we thought their war was unjust, indiscriminate, killing civilians, and not in America’s best interests. The first time we had the vote, we got a little over 20 votes to say that we should not be continuing to sell arms to the Saudis while they continue this abomination–20 something votes out of 100. We lost overwhelmingly. We had another vote about 2 or 3 months ago, and we got 47 votes. Now we have the killing and dismemberment of a journalist and dissident by the name of Jamal Khashoggi–something so brazen, so bizarre, so uncivilized that people are now coming together. In the last few weeks we have quit refuelling planes, yet the bombs continue to drop. We are still supplying the bombs. Some will argue: Well, it is already kind of winding down; we are no longer refuelling their planes. Yet, since Secretary Pompeo said about 3 weeks ago that the Saudi coalition should quit bombing civilian centres, the Saudis have dropped 200 bombs on Hodeida. Hodeida is a city where most of the humanitarian effort and food comes in. Yemen depends–80 percent of its food must be imported. It comes through this one port, for the most part. The Saudis–since we admonished them, since Secretary Pompeo said that they need to cease and desist from bombing civilian centres–have dropped 200 more bombs on the city of Hodeida, where humanitarian aid comes in. It must stop. Someone must take a stand and say: Enough is enough; we are against the humanitarian disaster in Yemen. They will argue: Well, then vote on that. I can’t have a direct vote on that. They will not let me vote on whether we should be at war in Yemen. I am allowed to vote only on this one small thing. This is a proxy vote. This is a vote that represents whether we should be at war in Yemen. It is an incredibly important vote. It is an attempt to grab back power from the Presidency. It is an attempt to have a check and balance on all Presidents of all parties of all beliefs. Here is the point, and this is the point which we should debate and which nobody debates: Who is more evil–the Revolutionary Guard and the Ayatollah of Iran or the Saudi Arabia Kingdom? If you look at it objectively, Saudi Arabia has spent over $100 billion teaching hatred of Christians, Hindus, and Jews around the world. They have opened tens of thousands of madrassas. The Haqqani network that has actually killed our soldiers in Afghanistan is supplied with money from the Saudis. The Taliban has gotten money from the Saudis. There was a report that a Saudi royal dropped off a check for $267 million to the Taliban at one point. So we are fighting these people, and we are arming these people. We should not be arming the enemy. What is it like to live in Saudi Arabia? We might ask Baqir al-Nimr. He was arrested at 17 at a protest. He is still in jail and is scheduled to be executed. They have a real “gloriful” way of executing you in Saudi Arabia: They chop your head off, and then they crucify you. So his head will be chopped off, and then his body will be displayed in a crucifixion post. That is what they will do to him. He was 17 when he was arrested. They have beheaded minors in Saudi Arabia. Oh, but we buy their oil, and we are such good friends with their sheikhs and their Kings. In Saudi Arabia right now, there are 3,000 people in prison who have not gotten a trial. There are nearly 1,000 people who have been in prison for 3 years without a trial–3 years without a trial, 1,000 people, and yet we continue to say: Oh, yes, but they oppose Iran. Who is worse–Iran or Saudi Arabia? Maybe neither one of them is good. Do you want to send your son or daughter to fight for the Iranian Revolutionary Guard? No. Do you want to send your son or daughter to fight for the Saudi Kings who crucify people? No. Maybe we don’t always have to pick sides. Maybe there is a time that comes when the thousand-year-old war between Sunni and Shia–let them fight it. Is there a reason we always have to send our sons and daughters to the Middle East? People used to say we have to do it for oil, which was offensive to me. We are doing it for oil and oil profits? We are now independent of their oil. We export oil. We do not need Saudi Arabia. People say: We have to have them, or Iran will take over the world. Saudi Arabia and their coalition partners spend eight times more on military than Iran does. What happens every time we send a dollar to Saudi Arabia? Iran then asks Russia for stuff. So it is an arms race that is fuelled by both of the larger outside powers with their proxies, and everything is a proxy war. But if you fool yourself into thinking that Saudi Arabia is the good guy and Iran is the bad guy, you have to ask yourself about the $2 billion that Saudi Arabia is spending in India–$2 billion over a 2 year period–teaching hatred of Hindus, hatred of Jews, hatred of Christianity, teaching that violent jihad is OK. Hundreds of millions of dollars, billions of dollars are spent by the Saudis, and people say: We can make a buck, and we can create a job. I, for one, would not try to create one job by selling arms to people who are our enemy. I don’t care about jobs if we are going to have to sell arms to our enemies. The arms belong to the American people, and the arms should be seen as a national security asset. We don’t sell arms to Russia, we don’t sell arms to China, and we shouldn’t sell arms to the Saudis who teach hatred of Christianity. There are Saudi cities you can’t even go to. Christians can’t go to Mecca or Medina. You can’t carry a Bible in Saudi Arabia. If you try to visit Saudi Arabia and bring a Bible in, you will be rejected at the border. This is not what we are for. Even those who have advocated for the war are now admitting there is no military solution. Recently, Secretary Pompeo said: No military solution in Yemen; let’s cease the bombing. General Mattis has said the same thing–no military solution. But they are not getting the signal. …I am saying don’t sell them arms one time. Do you think they will get the message? See, that is a message of strength. A lot of people around here talk about, we must have peace through strength, and we need to have a strong military. Well, do you know what? We need to have a strong foreign policy that says that we are not going to be pushed around by a bunch of two-bit dictators in the Middle East, that we are not going to be led astray and reject all of our values by sending arms into a war where civilians are being killed by the thousands. Seventeen million people in Yemen live on the edge of starvation. The city that a lot of the humanitarian aid comes in through, Hodeidah, is blockaded by the Saudis. I think that when we make decisions on foreign policy, they first should be made here. The Constitution intended that we declare war and that, really, foreign policy come from the people through the Congress, both House and Senate. If we were to have that debate, we would ask the question: Is our involvement in the war in Yemen in our national security interests? Is our national security enhanced by being at war in Yemen? I think the answer is unequivocally no. To those who say “Well, we must combat Iran,” Iran is being combated by Saudi Arabia, but Iran is not a threat to come across the ocean to see us. Guess who has come across the ocean. Do you remember 9/11? Do you remember who the hijackers were? Fifteen of nineteen of them were from Saudi Arabia. Do you remember the 28 pages of the “9/11 Report” that they wouldn’t let the American public read for years and years and years, for over a decade? You can now read those, and the implication is that Saudi Arabia was involved in 9/11, perhaps in the financing, perhaps in the planning. We actually voted overwhelmingly to allow American people’s–descendants of those who died on 9/11 to actually sue Saudi Arabia over this because of the implication that, yes, the 28 pages show that they were involved. …People talk about checks and balances, and we should be involved. Somehow we should check the President, who is assuming too much authority. This is your chance today. This is the check-and-balance. This is your proxy vote on the war in Yemen. There will be no direct one because they won’t allow it. This will be a proxy vote because it will be about weapons to Bahrain because we are not being allowed a direct vote on the war in Yemen. We should be. It should be one of the most important things we do in the Senate, and that is to direct foreign policy, to decide when we go to war. It is probably the most important thing we do under the Constitution, and we have abdicated it for decade after decade.